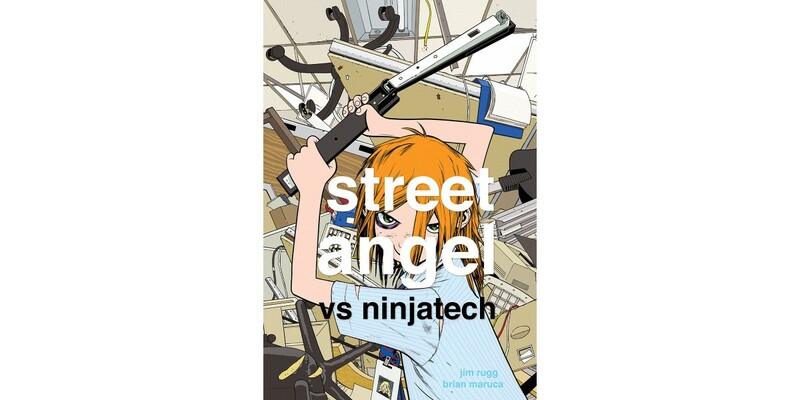 The Eisner Award-winning team of Jim Rugg (Afrodisiac, The Plain Janes) and Brian Maruca (Afrodisiac) will release STREET ANGEL VS NINJATECH—a brand-new tale starring your favorite homeless heroine, Jesse Sanchez—this November from Image Comics. After a hard fight with Ninja Carl, the deadliest girl alive seeks revenge—against the company that manufactured his dangerous weapons. It sure is convenient that it’s take-your-daughter-to-work day! In her new adventure, Street Angel makes some friends, kinda; helps out a witch, sorta; and fights the Assassin of the Future™: the Ninja 6000 ® by Ninjatech. STREET ANGEL VS. NINJATECH HC (Diamond code: SEP180117, ISBN: 978-1-5343-0856-5) will be available in comic book stores on Wednesday, November 7th. The final order cutoff deadline for comics retailers is Monday, October 8th. It will be available in bookstores on Tuesday, November 13th and can be preordered via Amazon, Barnes & Noble, Books-A-Million, Indiebound, and Indigo.